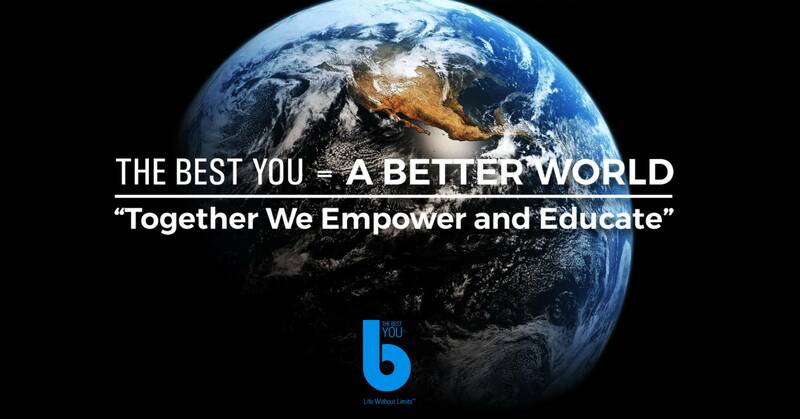 Founded in 2009, The Best You’s mission was to guide and inspire people on their path towards realising their greatest potential and to be a trusted resource for the personal and professional development community. This year, Bernardo Moya, Chief Inspiration Officer and Founder, announced a new mission for The Best You that will guide our work for 2019 and over the next few years. In the past, the personal development industry has always focused on changing the individual, not inspiring a movement, but we now have a responsibility as experts in motivational education and leadership psychology to inspire and transform groups of people to make the world a better place. By educating and empowering whole communities we can impact global change and create greater awareness of vital issues. The Best You believes that education and personal development leads to empowerment, and supports individuals, organisations and initiatives who strive to make the world a better place. With that foundation, our next focus will be to help dedicated individuals and organisations become the social energisers who make that vital difference. We provide practical answers, inspiration, guidance and programmes specifically designed to promote awareness and engage social action, and our varied platforms (magazines, digital tv, website and events) provide the transformative tools necessary to facilitate change. Bringing the personal development community together as a global community is a project bigger than any one individual or company, but let The Best You support you, because together we can make a better world. At The Best You, we recognise our responsibility to not only focus on self-development, but also to help make the world a better place. That is why we have announced a new mission and aim to make a real difference in changing the world. We believe in the importance of leveraging our network, events and platforms to have a positive impact on the thousands of people that we meet, educate and inspire. Apart from promoting mental health, empowering women and helping to fundraise for charities committed to addiction recovery, inspiring youth and anti-slavery, we help to inspire a global and local movement to save and restore the oceans! A21 – A21 is abolishing slavery everywhere, forever through awareness, intervention, and aftercare. Their legacy is freedom. Great Ormond Street – Great Ormond Street Hospital provides inspirational, world-class clinical care to hundreds of very sick children every day, giving hope to them and their families. Plastic Ocean – Plastic Oceans Foundation serves the ocean and the public by engaging people of all ages, in all social situations, to understand the danger of continuing to perceive plastic to be disposable. Plastic Oceans uses film, other media, and coordinated educational tools, to foster a global movement focused on changing how we use and dispose of plastics in order to ameliorate the toxic poisoning of our oceans and the lives that depend on them. SSAFA – SSAFA, the Armed Forces charity, has been providing lifelong support to our Forces and their families since 1885. Every year our staff and team of volunteers help more than 65,000 people, from Second World War veterans to young men and women who have served in more recent conflicts. Veteran’s Path – Veteran’s PATH enables returning veterans to rediscover meaning, purpose, and joy in their lives through mindfulness, meditation, and safe community. Practical tools of meditation and mindfulness, physical and outdoor experiences, and a community of camaraderie, veterans rediscover peace, acceptance, transformation, and honor in a new journey forward. Wyland Foundation – The Wyland Foundation is dedicated to promoting, protecting, and preserving the world’s ocean, waterways, and marine life. The foundation encourages environmental awareness through education programs, public arts projects, and community events.